Today we’d like to introduce you to Tapasya Katarina Stanisavljevic. Tapasya, please share your story with us. How did you get to where you are today? I started studying Shiatsu and practicing with clients while I was in a process of self-discovery that began 9 years ago. At the time I was getting interested in meditation, eastern philosophy and the arts. It was during a meditation course that I first heard of Shiatsu, stumbled into it and kept going. As a fresh graduate, I opened my own private practice in an artist’s residency in the heart of Wicker Park. That was a lot of fun and I grew in developing a style of practice that was entirely my own. 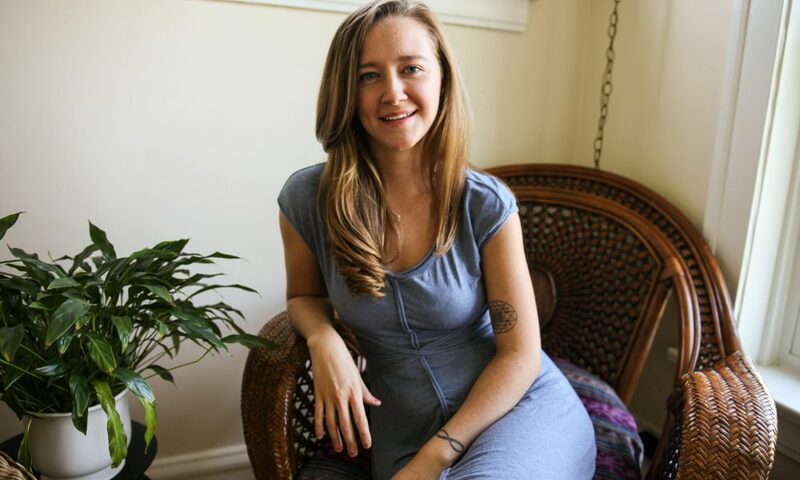 Over time, I continued to experiment with self-created bodywork techniques for healing and deepening spiritual exploration by improvising movement with clients and discovering ways of applying energy work, meditation and guided inquiry in sessions to open up possibilities for treatment. Around this time, I was asked to start teaching workshops in Evanston, so I began seeing clients there too, at the former Center for Integrative Healing Arts. It was during these early experimental years in which I found a sort-of “Jedi” ability within myself to sense pain, false belief systems and intuitively sense how to communicate, touch, and work with clients to facilitate major releases and energy freeing experiences. Years of emotional stress, physical pain, and disharmony was improved and cleared within a few sessions for clients. Eventually, I wanted to consolidate my practice and connect with a broader network of practitioners, which is when I moved my work to Zen Shiatsu Chicago in Evanston, the school I had graduated from, and where I currently hold my clinical practice and regularly teach students Shiatsu in the certification program. I also love seeing clients for treatment in their homes throughout Chicago, and offer Shiatsu treatments at events (festivals, retreats, corporate). I’ve had the opportunity to devoutly practice yoga and meditation throughout the years, going to India on retreat every winter for the last 4 years to live in spiritual community at Amma’s ashram in India, as well as become a Reiki Practitioner, a Certified Laughter Yoga Leader in India, teach Laughter Yoga, Meditation, Dream Circle, Wellness and Self-Care workshops and Shiatsu workshops in India, Bali, and in Chicago. I hope to continue expanding my reach of possibilities for teaching and sharing this work with the community, locally and internationally. It’s a gift to be able to offer this work, seeing clients, teaching and traveling, and continuing on the path of self-discovery and evolution as it unfolds. It has been an amazing journey and is still, always, in the making! I can’t say it’s been all love and grace, but certainly the road has offered many points of reflection, growth, expansion and leaps of faith. All along the way challenges arise in which I get the opportunity to look at myself, to see if I am living from a place of truth and in alignment with the highest clarity. The obstacles are the road, so I try to have the right attitude about whatever comes my way. Alright – so let’s talk business. Tell us about Tapasya Shiatsu – what should we know? I practice clinical Shiatsu, a unique bodywork therapy that uses light touch, gentle movement, energy work, and Chinese Medicine to bring forth greater health, happiness, vitality, balance and harmony in clients. Shiatsu is excellent at relieving physical pain from recent or old injuries, repetitive stress and tension patterns, improves mental clarity and acuity, and brings forth deep inner relaxation and an overall sense of wellbeing. Many Shiatsu clients call me with a specific complaint or treatment goal they would like to see a change in, and together we create a treatment plan that usually consists of 3-6 weekly sessions. During treatments, we address key issues within the body mind system to help clients experience noticeable results in how they feel and experience life. I teach and share what I know from direct experience, guiding individuals and groups through inquiry, exploration, and deepening within themselves. Classes are dynamic, fun, and students leave having had meaningful experiences. I love seeing students grow through our time together, clients transform over a few sessions, and learning all along the way. My greatest teacher, guide and inspiration on the path has been Amma, the humanitarian and spiritual leader lovingly known as “The Hugging Saint”. Words couldn’t express what her presence in this life has been. I am beyond grateful to Amma. I’m deeply honored to have trained with some of the remarkable practitioners at Zen Shiatsu Chicago. The school and clinic has been my homebased for study, practice and sharing for many years. The director, Steve Rogne, has been an amazing support, respected mentor, and beloved colleague in the field. Shiatsu Post-Graduate Studies teachers, Michael DeAgro and Scott Park Phillips, have truly opened my work into new horizons. Deep bow in thanks to them. All of my students and clients have been such tremendous teachers. I owe a wealth of thanks to them for helping me become the practitioner and person I am now. My family, friends, and every human I’ve ever met deserves credit for playing a role in my life. Thank you all!